You might have noticed that orange Monarch butterflies have reappeared in our area — and in Princeton Landing. Our Nature Guide Jon Latimer reports on the Monarch, the best-known North American butterfly. "Monarchs are large butterflies, with a wingspan of up to 4 inches. The upper side of their wings is tawny-orange with black veins and a wide black border marked with two lines of small white spots. The underside is a pale orange or yellow-brown. The veins on the female are thicker than those on the male. Males also have two visible spots on the hindwings. "A Monarch's bright orange color is a warning to predators. Monarchs lay their eggs on milkweed plants, which contain a strong toxic alkaloid. Young caterpillars feed on the milkweed and absorb the poison. When they become adults this poison makes them distasteful to birds. Few birds will try to eat a Monarch more than once. 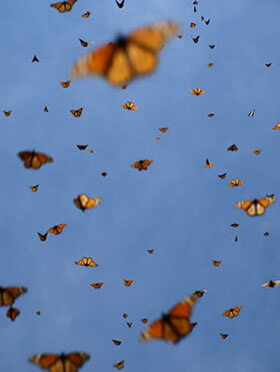 "The Monarchs we see are the result of a migration that has taken two or three generations to complete. In early spring the first generation leaves their wintering grounds in central Mexico, more than 2,000 miles to our south. The journey north takes three or four months, but these butterflies have a lifespan of less than two months. So Monarchs lay eggs along the way to create new generations to continue the journey. "After about four days the eggs produce caterpillars. A caterpillar spends about two weeks eating to store up nutrients to carry it through the next stage of its development. When it is ready, the caterpillar molts to become a pupa or chrysalis. After two weeks an adult Monarch emerges from the chrysalis and continues to travel north. This process may be repeated two or three times before the migration is completed. In fall Monarchs return to the same wintering grounds they came from. How they manage to find their way back after several generations have passed is a mystery. 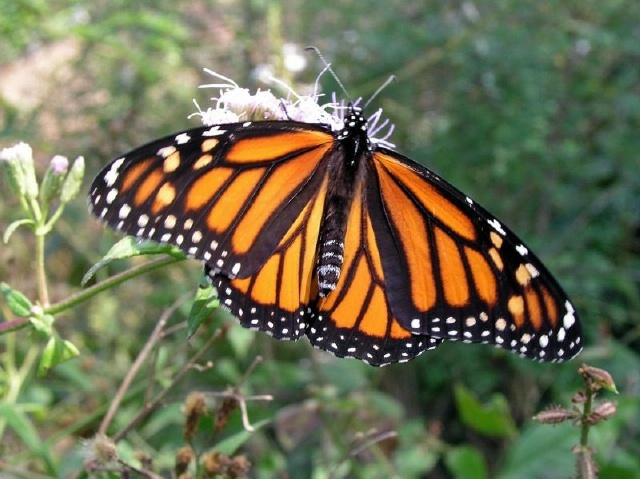 "Each fall millions of Monarch butterflies heading south pass through nearby Cape May. 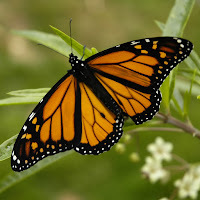 You can find out how to see them and learn more about Monarch butterflies at the Monarch Monitoring Project at the Cape May Bird Observatory."